Under the chandelier or on the veranda, G.H. 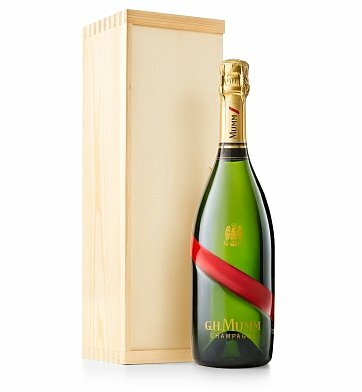 Mumm Grand Cordon Champagne is the perfect toast for any special occasion, from celebrating a retirement to wishing the best for the happy couple. Boasting complex flavors of fresh stone fruits, pineapple and creamy vanilla, the long finish of this French legend will linger on the memory just as long as it does on the palate. One bottle each of G.H. Mumm Grand Cordon Champagne. For more information on this wine, please see the Tasting Notes. G.H. Mumm Champagne Crate is a hand delivered gift. These gifts are delivered by one of our local design centers located throughout the United States and Canada. Same day delivery is available for most gifts when ordered before the cutoff time. The cutoff time for G.H. Mumm Champagne Crate is 2 PM in the recipient's time zone. One bottle of G.H. Mumm Grand Cordon Champagne. Presented in our signature enduring wooden wine crate.